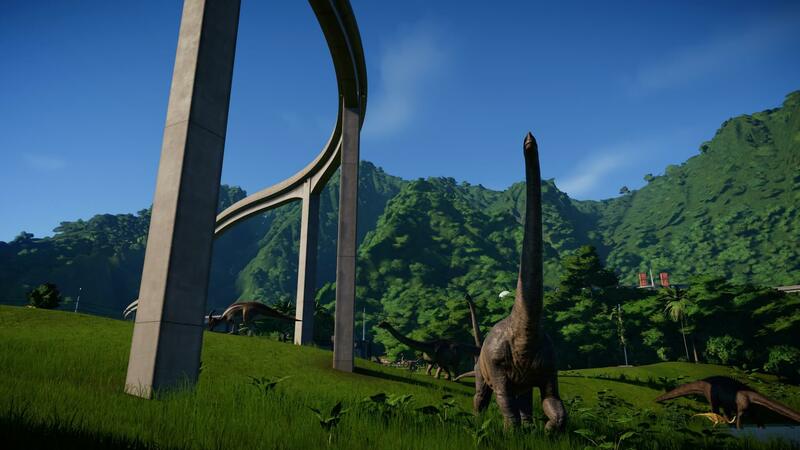 Jurassic World: Evolution review — Filling the tycoon void? There has been a Zoo-Tycoon-sized hole in my heart ever since it became incompatible with my computer a while back and a dinosaur-sized chip on my shoulder ever since… well, forever. I imagine — Zoo Tycoon being a great series and dinosaurs being almost universally adored by kids — that many of you feel the same. 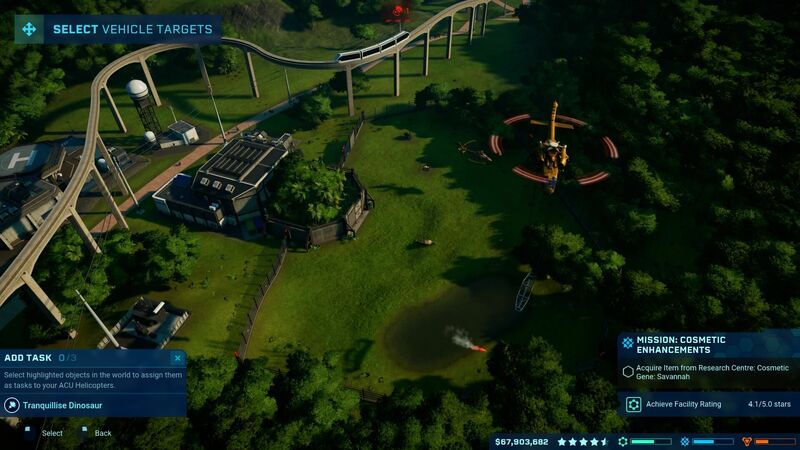 With the release of Jurassic World: Evolution teasing a combination of the two, we ask if it has it managed to capture the thrill of a prehistoric park tycoon. First, a little bit of history. This isn’t the first time Jurassic Park has made the obvious transition to video-game park management. Back in the early noughties, Blue Tongue Entertainment brought us Jurassic Park: Operation Genesis. I’ve never played it, and without forking out a good deal of money, I never will — it sells for around £70 at the moment and unopened discs have been rumoured to sell for up to £400. In any case, core elements of its gameplay have been brought forward into Evolution, so at least a part of its legacy has continued. 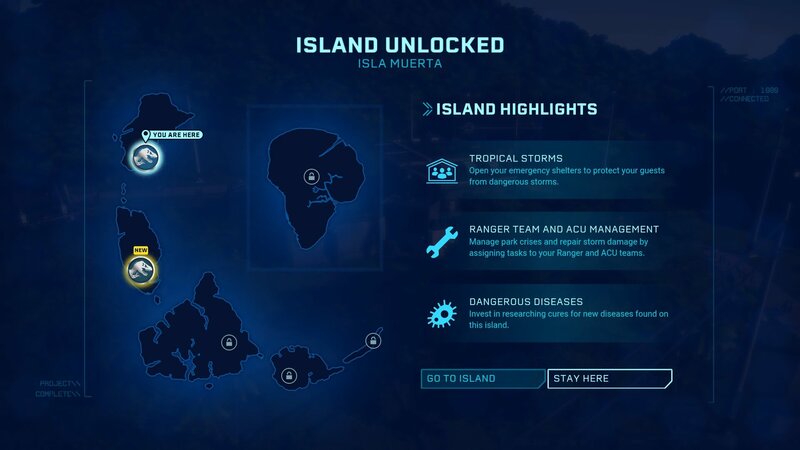 Jurassic World: Evolution sets itself within Las Cincas Muertes — the five islands making up the archipelago home to InGen’s ethically dubious business practices. You’ve been given the opportunity to turn abandoned parks and dusty fossils into a living, breathing and above all safe imagination of John Hammond’s dream. Each island has its own challenges to overcome. How you go about that is up to you, but over the course of the game you can unlock each of The Five Deaths to build upon. 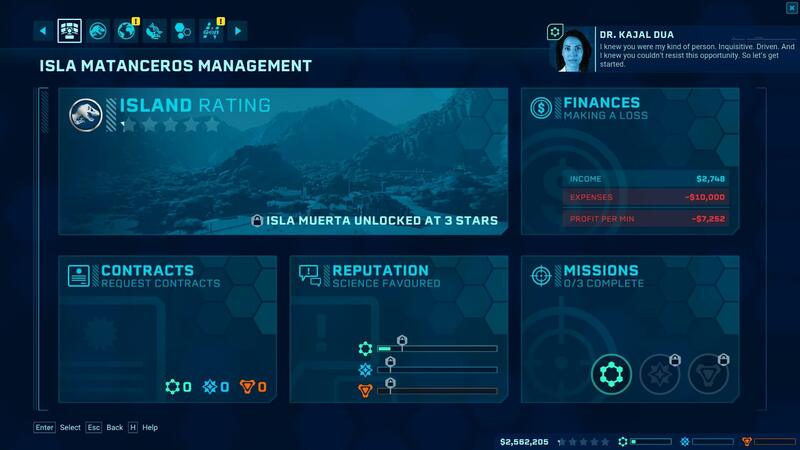 Each comes with its own initial scenario, which seems like a limitation at first until you realise you can unlock Isla Nublar pretty early on, and that acts like a sandbox — much as Site B did in Operation Genesis. The first item on your agenda for any new island, or any new building, is making sure your power network and paths all connect up. Every building needs a path connecting it to the main entrance (via other paths, of course) and a power supply, brought to it by pylons. The latter isn’t a concern in games like Zoo Tycoon, but it makes perfect sense for Jurassic Park. You can’t have a power outage plunge the park into chaos if you don’t have power, can you? This is, thankfully, an intuitive task. Notifications tell you when something isn’t connected and it’s clear to see where the power’s at when you’re placing substations, which power all the buildings around them. The only downside in the early game is that you can only place small power stations, which clutter up your park — but you can fix this later. Make sure to cultivate a network of power around your park. If the power goes down, you can be in trouble. Now, onto the main attraction: the terrible lizard. Every dinosaur you create has to be incubated at a Hammond Creation Lab, which straddles the edge of an enclosure (unless you really don’t like your guests). It’s wise to plan enclosures with this in mind, as they take up a good deal of space and it’s difficult to fit them in in hindsight. The islands’ terrain is not always your friend, making it unclear why some build spots are obstructed if you build close to the map’s edges. 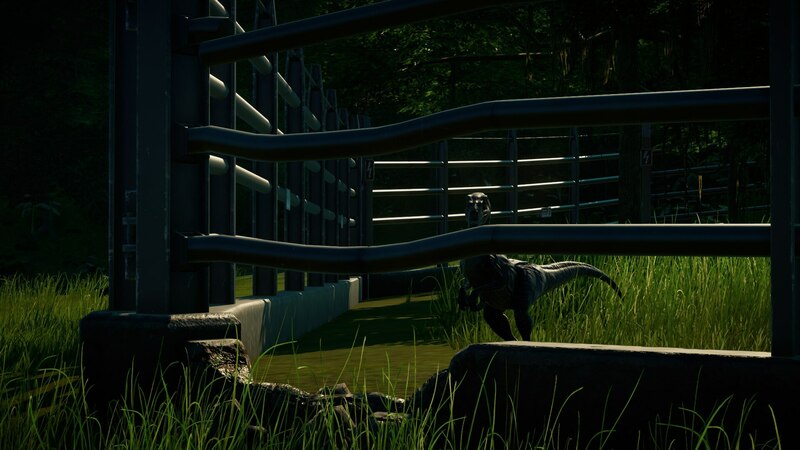 With a range of fences to choose from and unlock, the only thing to consider in getting your enclosure dino-ready is that the fences are powered (if electric) without gaps. It can be a good cost-and-space-saving exercise to build only one Hammond Creation lab and airlift dinosaurs to their enclosures from there. Each dinosaur has requirements for how many trees and how much grassland they need in their enclosure, plus meat or vegetation and water, but — except for those last few — you won’t know what those requirements are until you actually see the dino in the flesh. Dinosaurs have a comfort rating. That’s pretty much the sole focus of your attention when it comes to keeping them on the right side of the fence. If they don’t have enough space, their comfort rating decreases until they make a mad dash for the nearest fence — electric or not — and try to batter their way out. The same goes for not having enough water, even one tree too few or too many, being enclosed with too many other dinosaurs or — woe betide getting this one wrong — not enough members of their species to socialise with. Starvation tends to make itself known before discomfort. Still, it’s no good having happy dinosaurs if your guests can’t see them galavant across the plains. Viewing platforms, overhead monorails and gyrospheres let your guests get up close and personal without getting too personal. Make sure you leave space for them when you build enclosures, as visibility affects your park’s overall rating. Taking the helicopter for a spin is also a good way to see your park from above. Obviously, dinosaurs fighting each other is a problem, but you can easily avoid that if you’re sensible. Comfort is most often the cause of park disasters, even concerning herbivores. We saw a trio of (thereafter-hated) Tsintaosaurus break out around four times before we met their social need. The fact that dinosaurs try to escape as soon as being returned to their exhibit — even after being tranquilised and airlifted — was a bit of a frustration. We feel like there could have been different behaviours for different problems: listlessness for lack of company, fights breaking out for overpopulation and so on. Breaking out of enclosures would be better as a dinosaur’s last resort, but this one-trick pony is probably a side effect of breakouts being controlled by the comfort stat alone. It doesn’t help that there are no alerts to show a dinosaur is uncomfortable — not even a ticker tape at the top of the screen. Two more points for improvement are probably restrictions of the IP surrounding the new Jurassic series. One is a favourite feature from Zoo Tycoon, the ability to manipulate terrain into different biomes. 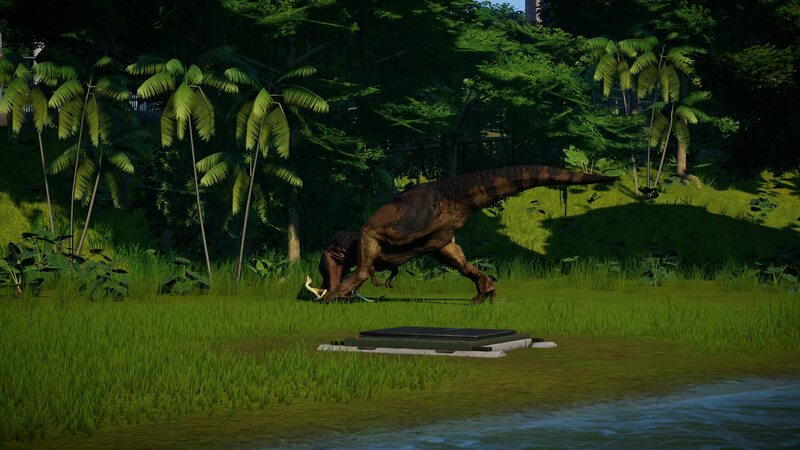 Dinosaurs lived in vastly different eras in vastly different environments, so being able to present them as such would have been both a benefit to immersion and extra fun added to park creation. But film Jurassic World didn’t have biomes, so we don’t get that luxury. Perhaps (fingers crossed) in a DLC. All things considered, our raptors were surprisingly well behaved. Another lore requirement is that InGen dinosaurs, with the exception of the escapees on Isla Sorna, can’t breed. 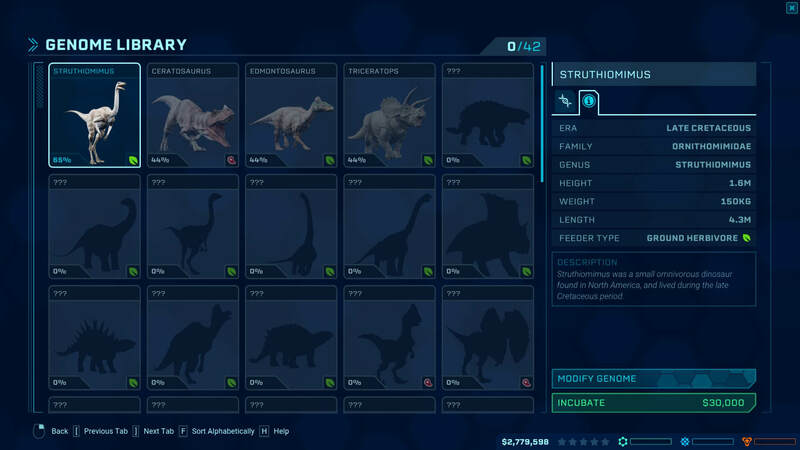 It makes perfect sense to keep this in the game, but it would also make sense to remove that restriction at 100% genome completion, letting that species breed. The idea was scrapped from Genesis due to time constraints, so perhaps the same was true here — it would have been nice to make park life less artificial and give rise to dinotastic dynasties. In any case, escaping dinosaurs give rise to problems. You have a fence to repair, guests to keep safe and dinosaurs to recapture. The guests are the first thing you need to deal with. If you remember to build emergency shelters, you can open them all to herd everyone to safety — not that it matters to anyone stood next to the dinosaur at the time. If you have a serious problem, you can shut the entire park by clicking on the entrance. Thankfully, ploughing through guests as they run to shelter doesn’t do them any harm. Next, you fix the fence and dispatch an Asset Containment Unit. Fixing the fence means calling a ranger Jeep from the ranger station — or driving it yourself — and clicking on the part to repair. The ACU can be called from their own building, where they depart in a helicopter to tranquilise the dinosaurs you select. 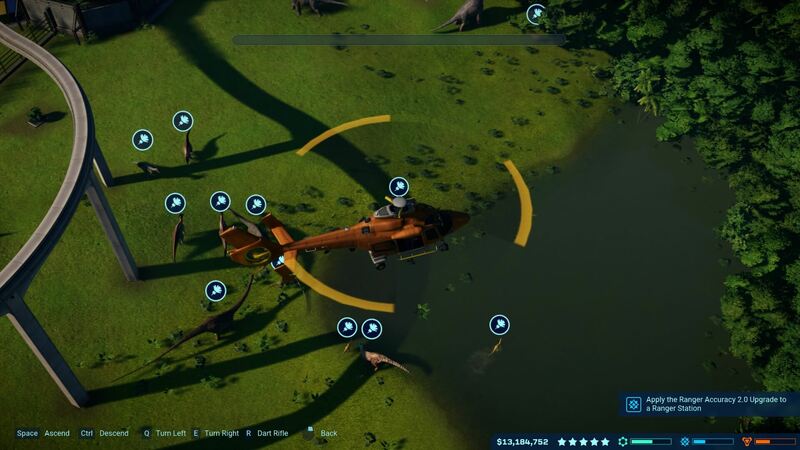 Again, you can pilot the helicopter yourself, but the AI tends to be more accurate with smaller (or mobile) dinos. As soon as any dinos are tranquilised and the fence is repaired, you can start moving them back to their enclosure. Using the ACU building, you can assign transport teams to carry them all back. This takes a little while, so try to fix whatever made them escape while you wait. Other disasters such as tropical storms and sabotage can put your park into disrepair and while they can both be prevented in their own ways, they still leave you with maintenance to carry out. Storms can cause damage to your buildings, so make sure to prepare against this or be on hand to repair them. Evolution doesn’t give you anything for free, though (apart from the upcoming DLC). Maintenance teams just sit in their driveways until you give them a task. Unless that happens, food remains unreplenished, dinosaurs unmedicated and fences unrepaired. In Zoo Tycoon 2, staff handled all simple tasks for you and you could intervene if you wanted to wander around. That isn’t the case in Evolution and it feels like an opportunity missed. Speaking of opportunities missed, dinosaurs never attack staff. Nothing will go wrong in the long term as long as you have money and feet (or wheels) on the ground. There can be no pitiful Nedry deaths among employees, no terrified sneaking around the park to repair and reboot security systems while dinosaurs roam. It would have been an excellent feature to include, adding a very real consequence and challenge to getting things back under control. Such a feature has never been available in the genre before, but if you can’t add it with Jurassic Park games, when can you ever? Of course, guests can be eaten by dinosaurs and, much like dinosaurs, they need to be kept happy to keep the sweet, sweet cash flowing in. To ensure this, you need to spread a balance of food, entertainment and transport buildings around your park to make sure they have access to everything they need and don’t have to walk too far (considering how far ‘far’ is, the guest are incredibly lazy, which is about accurate). You can tell how guests feel about your park pretty easily by clicking on your star rating or looking at management overviews to see where you’re lacking, but there are no more detailed glimpses than that. This is largely because guests in Evolution aren’t exactly real people. You can’t click on them or interact with them and they seem a little ‘off’ at first until you realise there are no children. We guess this must be some Bethesda-style child-violence avoidance at play here, but odd considering Jurassic Park stories always feature children. This lack of living, walking people also, strangely, extends to the player. While you can walk or fly around your park to your heart’s content, you can’t just wander around on foot — which was one of the great attractions of Zoo Tycoon 2. At least you can take photos from the Jeep, though, as well as darting dinosaurs to medicate them. Add to this the fact that there are no miscellaneous decorations or individual landscaping items, only the revenue-or-resource-generating buildings you can unlock, and the count of missed opportunities is starting to rack up. Taking photos from your Jeep does let you capture some pretty cool moments. But how do you unlock more stuff? 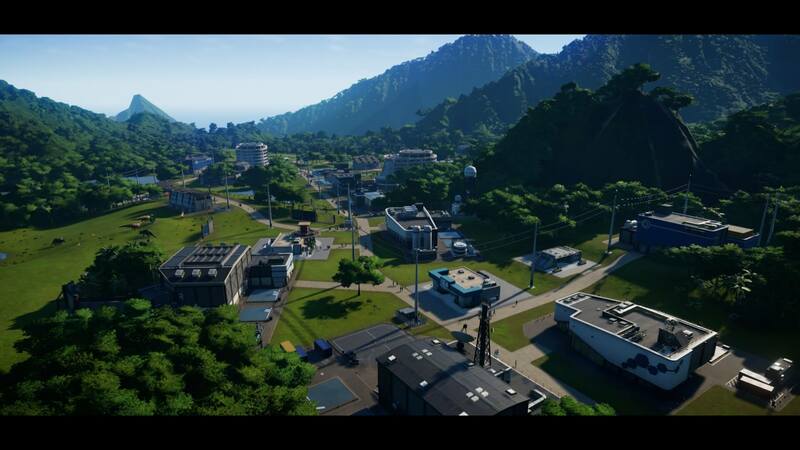 Jurassic World: Evolution gives you control of three departments within your park: science, entertainment and security. You can gain reputation with each department by fulfilling contracts for cash money. 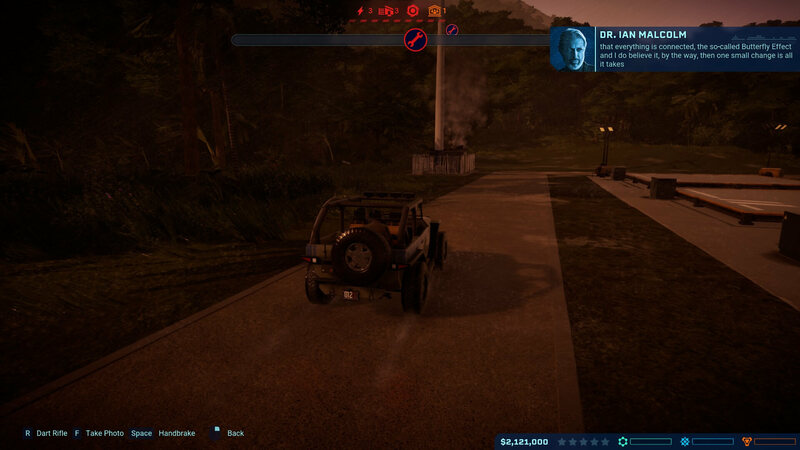 Get the reputation bar high enough and they give you a mission to carry out — this is what unlocks new buildings, research, dinosaurs and islands. Watch out, though — completing a contract or mission from one department may reduce another department’s satisfaction with you, even when it doesn’t make sense that they would. Get a score too low and your park is at risk of sabotage. If we take a step back and look at some of the feedback Operation Genesis received, two of those points were that time couldn’t be sped up (a common feature in similar games) and missions became repetitive. The same can be said of Evolution. In contrast to the incredibly specific scenarios of the Zoo Tycoon series, contracts in Evolution get old fairly quickly and missions are the only source of slightly better variety, like assisting dinosaurs to combat victories or accepting free dinosaurs as long as you heal them. You can take on multiple contracts at once (at intervals of a minute), but can only have one mission active at a time. We haven’t talked about the sciency part of Evolution yet. To successfully incubate a new dinosaur, you first have to extract its genome from fossils. You do this by sending expedition teams out to sites around the world, bringing the fossils back and extracting their DNA. It’s interesting at first, but becomes repetitive, with a lot of waiting around. Perhaps it could have been streamlined by adding some automation to the teams — with a rolling budget for continuous excavation, controlling their dig speed — or eliminating manual genome extraction entirely in favour of a message saying which fossils have been found. You can only incubate dinosaurs once their genome is 50% complete. 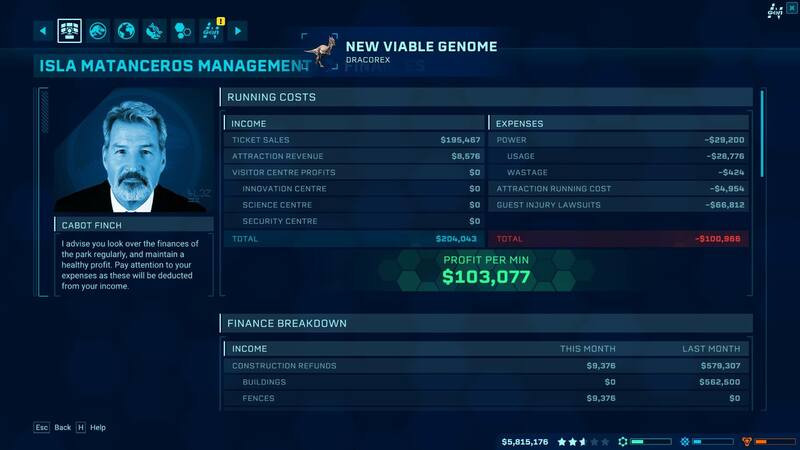 The genomes themselves can be modified to adjust various stats on a dinosaur, or just adjust their cosmetic appearance. That said, the skins you can apply don’t really change patterning, they just change the colours, which feels like a bit of a cop-out considering the drop to viability (which sets the success rate of incubation) this induces. The physical stats are fairly useful to modify in terms of increasing lifespan and reducing susceptibility to diseases, but some are more suited to dinosaurs in regular combat situations — which means you get that choice on what you want your dinos to be. Modified dinosaurs are more exciting to guests, but it can take four attempts to release one if they have low viability. 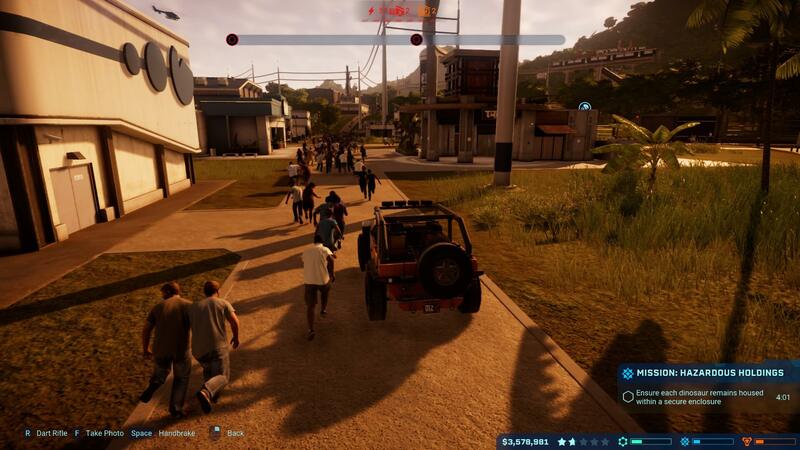 Jurassic World: Evolution was highly anticipated but has been somewhat anticlimactic. There are so many ways it could have improved upon the film’s formula and even that of the genre, but it has missed opportunities left, right and centre. We do recommend it, though. The graphics are beautiful and the dinosaurs are interesting to watch. There’s still no denying that it’s a fun game, but it’s just missing a certain something. It feels empty — it’s missing the vibrant heart of creation. In a series where playing God is the first butterfly flap to chaos, there seems to be too little wingspan and not enough storm.